Geared to Quality & Service ISO 9001:2015 Registered. Specializing in hydraulic pump shafts, keyed shafts, spline drive shafts, spindle shafts, shafts for marine, power take-off, defense, aerospace, construction equipment and mining applications. Specialists in gears for the hydraulic pump industry. Gears for power take-off, transmissions, tractors and construction applications. Internal and external splined and keyed couplings and connectors. 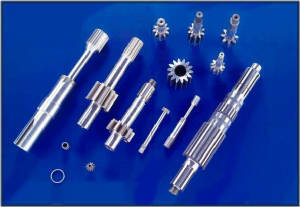 In addition to the complete manufacturing of gears, shafts and couplings for the Construction, Hydraulic, Power Take-Off and Marine Industries, Orlandi Gear also offers contract machining such as CNC turning, CNC hobbing, CNC grinding, gear cutting, shaving, internal and external splining. We have the capability of manufacturing splined and keyed shafts up to thirty-six inches long, and to shave or grind pump gears to 3 DP. We manufacture a wide variety of splined or keyed connectors. We also service the the hob and shaper cutter sharpening and de-coating market, and can offer these services to regional businesses at reduced rates with quick deliveries.